The World Health Organization (WHO) and the Mundo Sano Foundation are working to make an essential antiparasitic medicine for treatment of Chagas disease widely accessible to children. Treatment with benznidazole in the early stages of infection can cure the Chagas disease, but currently very few people are able to access diagnosis and treatment services. 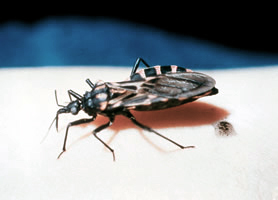 “The cure rate for Chagas disease is almost 100% if treatment occurs early after infection, particularly in the early years of life,” said Dr Pedro Albajar Vinas, Medical Officer with WHO’s Department of Control of Neglected Tropical Diseases. “For cases in children born from infected mothers – as high as 15 000 new cases per year – a pediatric presentation with improved dosing accuracy will greatly help in the treatment of congenital infections.”.